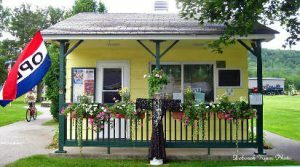 Gorham Moose Tours is based in Gorham, NH, along the northern edge of the White Mountains, and you’ll find their tour booth in a public park along the main street in town. They’ve got a ton of tourist pamphlets for the region and have helpful information. Then you get into a van that seats up to 20 people and head out to find your moose! Like finding any animal in the wild, you are not guaranteed to see moose, but have a decent shot at at least seeing a few. 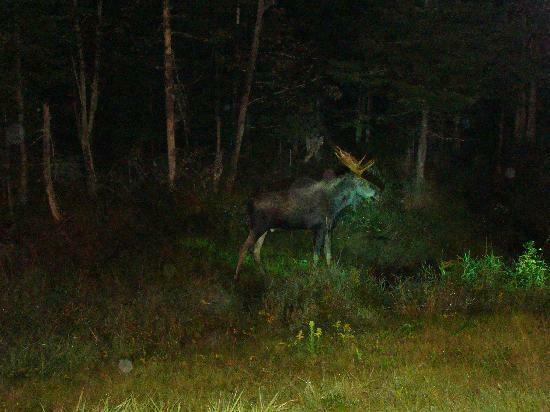 Moose are attracted to roads for two reasons. First, just like us, they crave salt, and because of salting roads during icy winter weather, you can find a lot of salt along roads. Also, moose are so big that they prefer to walk through woodland trails than push through heavy brush. They don’t know that roads aren’t forest paths. 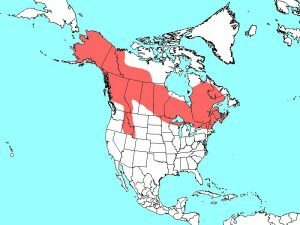 That’s why you should be so careful driving in moose areas at night; your chances of hitting one on the road are not so remote. Our guide was Gary, who had positive energy and taught us a lot. He gave us a fridge magnet, bumper sticker, and handout on identifying animal tracks. He played a video about moose for us to watch, something that we didn’t need early on, when the sun was still setting and we had energy, but could have used later on, when we were more tired. Tours run from late May to late September, but June is the best time for moose tours. Going during peak season is a priority, because tours run 3 to 4 hours, and if you don’t find moose conveniently, they’ll drive all the way up into Maine. Our trip was 4.5 hours. We were delighted to see 4 moose, but at night there’s no possibility of taking good amateur photos, and most of the moose we saw were in the woods and walked away from us after a minute. We did see one moose in the middle of the road, so we got a great look at it. Unfortunately, even for a bucket list item, 4.5 hours was just too long. Tourists are weary, our cell phones had no service, and the driving at night seemed endless. Having seen our first couple of moose, if Gary had given the group a choice, I think as a group we may have been ready to return to base rather than press on and try to see more. To his credit, Gary did a good job keeping his energy up. He told us anecdotes and stories for the entire trip, even though the tourists in the van were too tired (and the acoustics weren’t right) to respond to him. Many of us napped, others chatted amongst themselves. The tour was well managed and we stopped for bathroom breaks along the way. You’ll have a great time if you come with the proper expectation. Try to go in June, and come with a movie pre-loaded onto your phone, or expecting to nap. Gary was good to us, but I read on TripAdvisor that Laurie may be the one to ask for. Although I’ve been on better moose tours in Maine, and during the day, when was the last time you visited northern Maine? Unless you’re a hiking or boating enthusiast, you’re far more likely to be in the White Mountains for summer fun, and the base for Gorham Moose Tours in Gorham, New Hampshire has far more tourist amenities. That makes them super convenient for checking off your bucket list item of seeing moose. 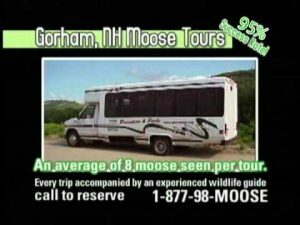 The tour is not expensive, and perhaps we just came on an off night, so I’ll give Gorham Moose Tours 4 stars.